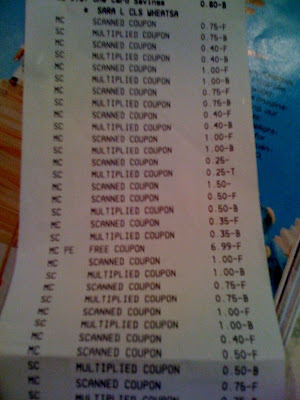 Tonight we set out for our first coupon-using shopping expedition. I claim....SUCCESS! I feel successful anyway. Actually, I feel like I made us $50 in about an hour. to $1 with their shopper card. --Also, Homeland has overlapping circulars and Tuesday is a great day to go because both circulars are valid at the same time. 3. I've been collecting coupons for a few weeks now from our moms (who both get the Sunday paper), so I took what we needed and matched up against things that were on sale and that I had coupons for. Then, after I exhausted those, I tried to match up the rest of the coupons with things we needed. 4. We shopped. Just off our list. Except for fruits and veggies, we didn't buy anything not on sale or without a coupon and we only bought from the list. 5. We got to the register and saw our total...yay! It was on sale with the One Card for 2/$6. 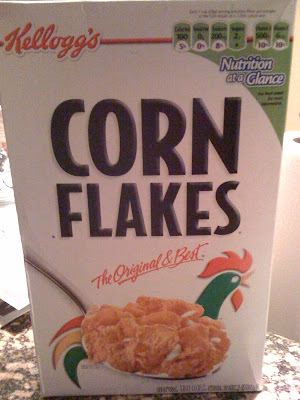 But I don't need two huge boxes of Corn Flakes so I just got one, for $3. -$1.00 double the coupon with One Card. And basically you do that the entire time. So our grand total savings? Do you see that? 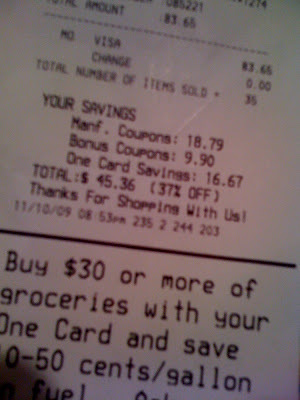 Between our coupons and sale card, we saved $45.36, or 37%! Woo hoo! Not bad for a first run, right? I'm pretty happy. And the sorting coupon prep took maybe 1/2 an hour or so. I did it at the kitchen table while Kevin fed Riley dinner. It didn't even seem like a big deal. I'm so encouraged by this and so ready to get better at it. Can't wait to see how good we might get at this... I never knew grocery shopping could be fun! Teach me. I tried and failed. Sad as that is.